Solar PV systems simply convert sunlight into electricity. 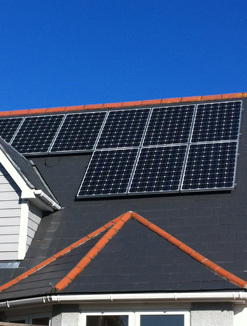 An array of solar panels are installed directly onto your roof and connected to your existing power supply. This electricity is fed straight into the power supply of the property. It saves on your bills as the system always uses your own PV electricity before drawing it from your power supplier. Any excess is then automatically exported. The main incentive, however, for installing PV now comes in the form of payback from the government for the power your generate. The Feed-in Tariff scheme offers you a fixed rate, tax free income on all electricity your PV array produces. On top of that you are helping to stop climate change, reducing co2 emissions and your carbon footprint. Meridian Environmental can install or supply Solar PV arrays from 1kW upwards. The above will be paid for 20 years from April 2010. They are tax-free for domestic properties and are indexed linked to the RPI (Retail Price Index) to protect from inflation. E.g. Installing a 1-4kW system on an existing house in 2010 would mean the customer would lock-in to the 14.9p per unit (kWh) payment for 20 years, indexed linked to RPI and tax-free. Meridian Environmental Limited are a code member of the RECC and as a member have to make you aware of the Alternative Dispute Resolution (ADR) Service that the RECC offer. Information can be found in Section 9 of the Consumer Code which can be accessed by clicking the link below. View Meridian Environmental’s Solar PV Customer Warranty for Installation Services. Simply click on the PDF icon to view the document or right click on the PDF image and select ‘Save As’ to download a copy and view. Meridian Environmental cover the whole of Bournemouth, Poole, Dorset and the surrounding counties. We have a wide range of expertise in Solar Photovoltaic (PV) & Electrical contracting within both the Domestic and Commercial sectors.